Before our move to Alaska, my life was pretty safe. I’d never really met an on purpose mean person. I was about to. The tow truck operator …. I do remember his name but will keep it to myself. From now on I’ll refer to him as “the man” and his place of business as “the shop”. I forgave him years ago. He had a gas station/car repair/tow service…I think the only one in town. There’s no doubt he did a tremendous service for us. He had to use his biggest truck and cherry picker to pull our truck from its unhappy place. It was an all day affair that involved several people and Doug. We knew it would cost ….he made it clear upfront. But when we arrived at his shop, he demanded more. Tok is a small community … it was smaller then. There really wasn’t anyone to complain to. He held all our earthly goods on his property. We paid him. This left us dangerously short of cash for the rest of the trip. Not to mention, we didn’t know if we had a running truck. He also offered to fix the truck …. for more money of course. No surprise…we declined. 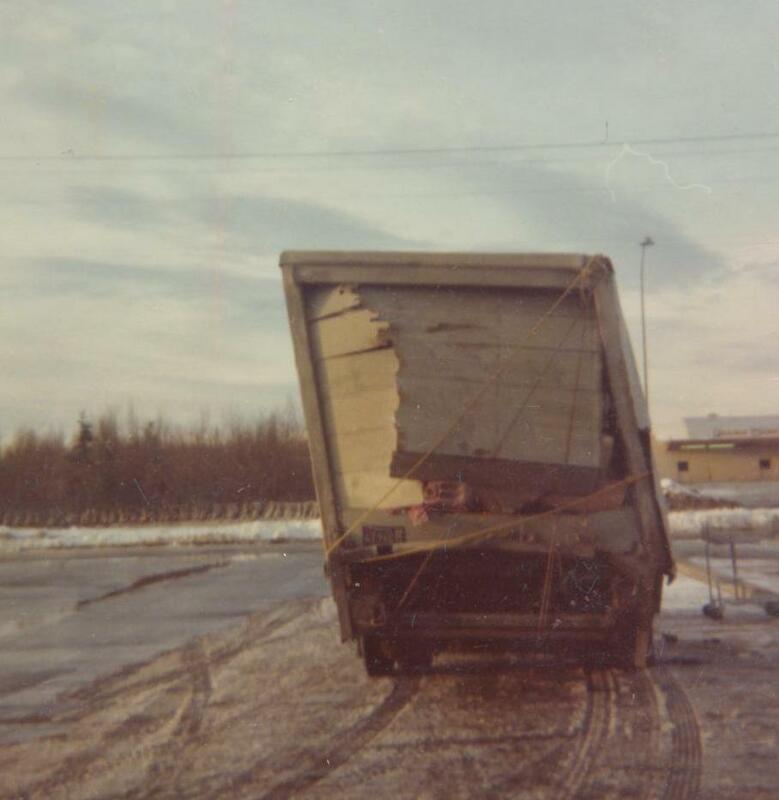 Most of Doug’s tools were smooshed in the damaged back-end of the truck. We couldn’t risk opening it until we reached our destination – or – till the truck was declared officially dead. So Doug began his “assessment”. As a non-mechanic with few tools available he was in a tough spot. We unloaded the cab and tilted it forward so he could get at the engine. 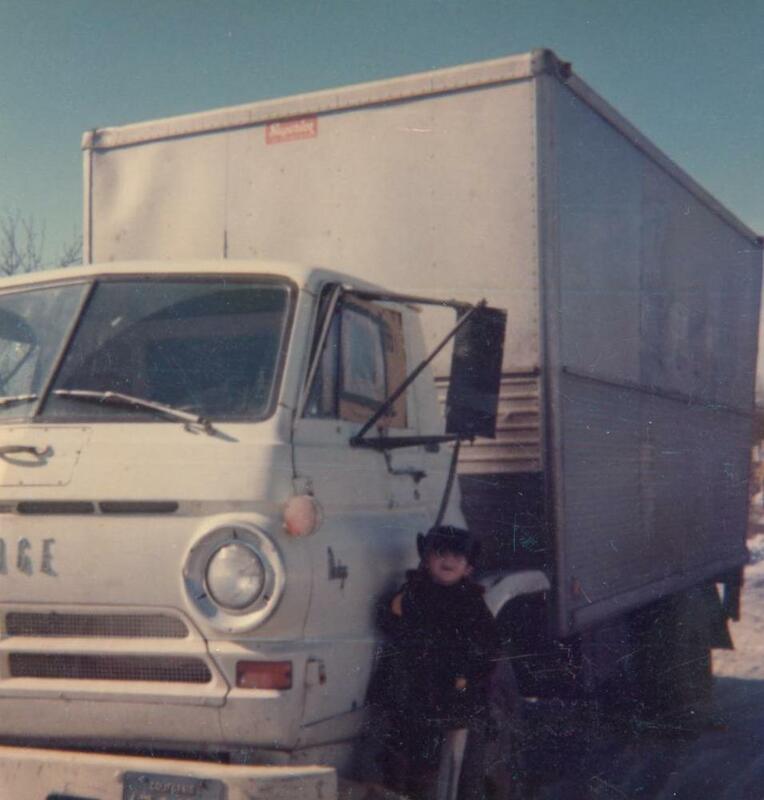 We looked like the Northern Exposure version of the Grapes of Wrath…. bashed up truck, personal goods strewn about. I had to find a way for Ian and I to make it thru the day while Doug worked. With the cab tilted we couldn’t sit there. And keeping in mind…this was Alaska…still in the grip of winter… around 10 degrees F. ….it wasn’t a very hospitable environment for a pregnant gal and a toddler. There was no Denny’s on the corner. There was no corner! The shop was on the edge of town…very little else around. Across the road and down was a small restaurant with a “No Loitering” sign out front. So who was around to loiter?? Me? I was beginning to take things very personally. Inside the shop’s “waiting room”, a few feet from Doug and our truck, was the man who had just ripped us off, two large dogs, and an older couple I assumed were his parents. I asked if we might pop in occasionally to thaw out. He said no….that’s where his dogs stayed and they didn’t like strangers. So Ian and I took a walk….came back frozen to the bone ….I asked if we could just step inside the workshop area…no one was in there. He said no…the shop was full of dangerous equipment. I asked if we could use the restroom. He said no…he didn’t have a restroom. He had made himself perfectly clear. Ian and I left for the restaurant. They were friendlier…as long as I was buying something. So that’s what we did …. we’d pop into the restaurant for hot chocolate and the bathroom… walk back to Doug, sit on a box wrapped in blankets, read stories….walk back to the restaurant and order some small thing….and on and on that went. Every now and then Doug had something I could help with. We just kept as busy as we could to stay warm. All the while … the man, his dogs, his parents sat inside watching. And Ian… as he’d been throughout the entire trip, was a trooper. Later in the day, while the man was gone on a call, the older gentleman appeared at our truck with a tool he thought Doug could use. It made all the difference. By late afternoon the truck was running. It didn’t look like it should run, but it was! It was an amazing moment of triumph to shove our belongings and ourselves into the cab and drive to the motel. More amazing… Doug had not taken a single break all day, working on the engine with bare hands in freezing temps. But before resting our weary bones, we stopped at the weigh station to learn what our chances were for clearance to hit the road. The trooper was amused by the sight of us, but at least he was nice. He gave us directions to the general store. 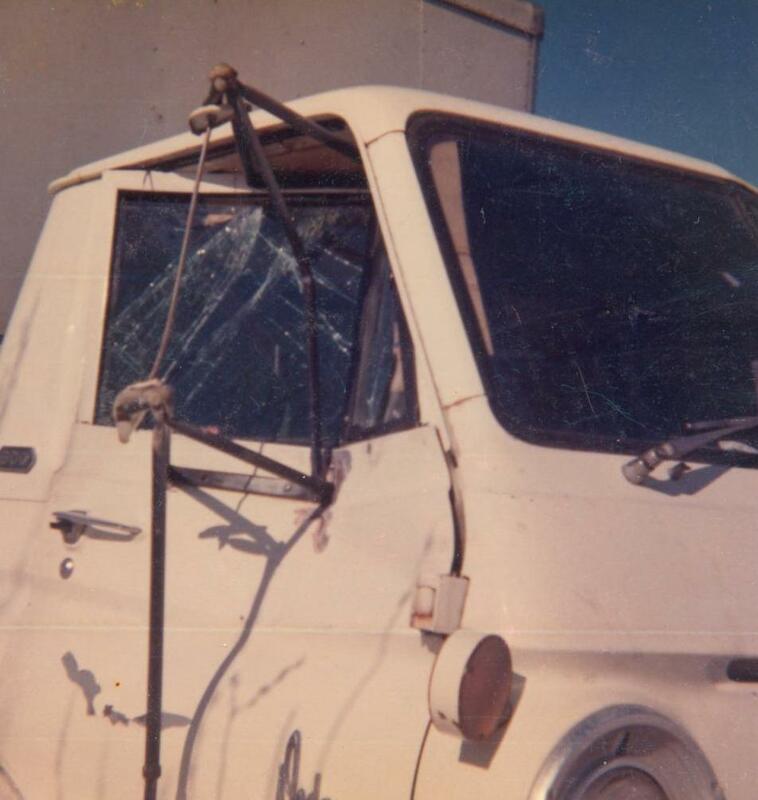 We were to get more heavy-duty rope to secure the back end…and we needed working tail lights. He told us where we could get the best dinner in town, wished us a good night’s rest and told us to come back in the morning. We did all that plus…. Doug fixed the gaping hole in my door with cardboard and duct tape. 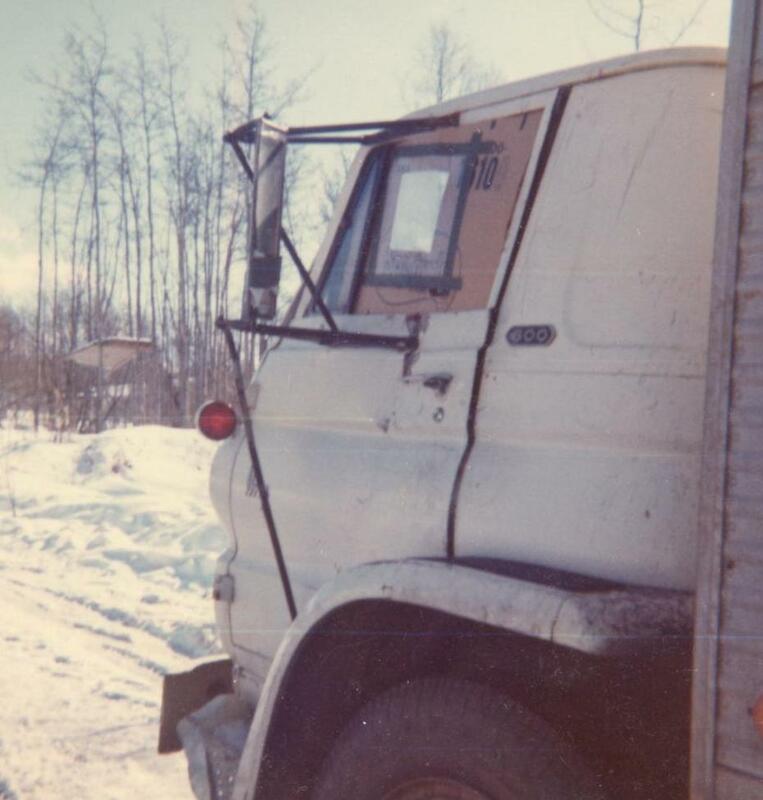 He created a window for his door with cardboard, clear plastic and more duct tape. We McGillivrays do love our duct tape! And I loved his determination and creativity. And we did get to Anchorage, of course. It’s just over 300 miles from Tok, but it took us two more days. The poor old truck had issues, but it got us there. Anchorage is really the true beginning of our story…. but I’ve got to take a break and spend some time in the present day. This journey has been long …..I’m worn out. Glad the World didn’t end Today…..
Love your on-going saga – you’re very good at the “what happens next?”, leaving us wondering. I finally put you on my blog list to recommend it to others, sorry it took me so long to get around to doing it. Hope it helps more people to start reading your posts. Thanks for doing that, Maureen. I feel honored. I definitely have more of the saga to share, but I’m thinking I need to take breaks and be in the “present” now and then. I’m not sure how it’s all going to unfold, but I’m having fun. Thanks for your encouragement.